Emergency backup generators and portable generator systems are a godsend during any situation in which your access to power becomes suddenly and unexpectedly compromised, providing access to contingency electricity for light, heat, cooking, and running essential appliances or devices. There are almost countless emergency situations in which you may find yourself cut off from the power grid and in every one, a reliable portable emergency generator can make the difference between keeping the lights on or having to make do without electricity. The best outdoor generators and emergency backup generator systems mean that if you find yourself without power, you’ll be able to bring things back online with minimal effort. In an age of instant energy on switch, it can be all too easy to forget that our access to readily available power is actually the exception rather than the rule and that this luxury is a mere natural disaster or unexpected emergency situation away from disappearing. If you’ve ever found yourself without electricity, due to an extreme weather event or a major power outage, you’re probably all too aware of just how difficult things can quickly get if the situation becomes prolonged and you’ve not got a backup system in place. In these instances, having a backup power plan in place forms a core component as the foundation of any survival strategy. Once physical safety, adequate shelter, clean drinking water, and access to sufficient nutrition are covered, ensuring a connection to a reliable power source when needed is almost certainly the critical thing to make sure you have in place if you find yourself in a situation suddenly unplugged from the grid. 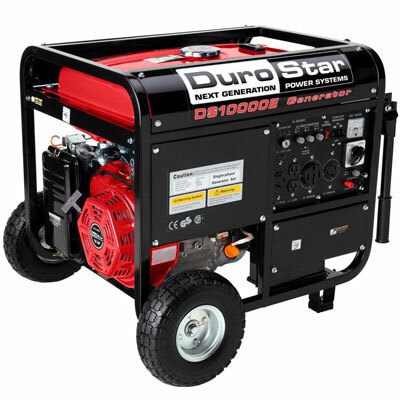 Before we get into breaking down the best emergency backup generators for the money, it’s a good idea to briefly talk about the main differences between the two kinds of emergency generator on the market – those powered by some form of gas or similar fuel and solar powered generators that derive their energy from the sun. While the main difference between these two kinds of generators seems obvious, it’s the specific (and significant) pros and cons of each which need to be looked at in detail when deciding on the best generator for your needs. When we talk about a solar generator system, what we’re really describing is a combination of photovoltaic (solar) panels connected to a long-lasting, high capacity battery unit which is used to store the captured solar energy and which you can draw upon for power when needed. The obvious advantages over this kind of generator system are that firstly, solar energy is free and unlike conventional gas fuels, doesn’t need to be stored, and secondly, no moving parts means that operating this kind of generator setup is silent. The swing side of these benefits are equally obvious however, and by far the biggest drawback of solar generator systems is that – you guessed it – they’re totally dependent on the sun shining. While you’re going to get some energy captured on overcast days, the return is going to be significantly lower than on a bright sunny day. Of course the main idea of this kind of system is that you will collect and store the energy when times are good (and when the sun is shining) and can then call on your fully charged batteries when times are not so good, however for many people, this may not be an acceptable solution as a power redundancy for an unexpected emergency that could strike at any moment. To learn more about the best solar generators for use in an emergency situation, check out our guide here. Gas powered emergency generators on the other hand (which we’ll be covering in this guide are not dependent on favorable weather conditions to begin generating power meaning so long as you’ve got an adequate supply of fuel stocked up, you can be up and running again immediately. Batteries can still be charged from the generator if required, but this is an optional extra with this kind of generator. 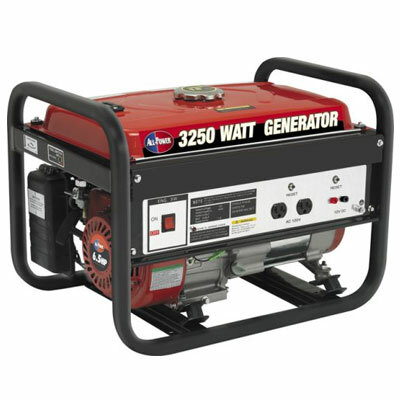 The major drawbacks of emergency gas powered generators come in the form of operating conditions (gas generators can be both noisy and almost always have to be operated outside or in an area with adequate ventilation) and the fact that they require a stored supply of fuel to ensure continued operation. Ultimately, there are good and bad points to both kinds of emergency generator systems and the decision of which type is best for you will really depend on your individual preferences, requirements, and circumstances. In this guide, we’ve taken a look at the very best gas-powered emergency generators for getting your power supply back online with minimal downtime. If disaster strikes and the lights go out, these high performance power generators are durable workhorses designed to keep you up and running no matter the emergency. As you’d probably expect from the name, the major benefit of dual fuel generators over their single fuel siblings is the ability to effortlessly switch between either petroleum or propane as the main source of fuel. There are a couple of major advantages to this kind of generator system and these go beyond the obvious benefit of the increased flexibility of choice. Generally speaking, gasoline (petroleum) is considered easier to get hold of for use during an emergency and there are often economic benefits of this fuel source over a propane alternative. On the other side of the coin, propane often represents a ‘cleaner’ fuel which is less likely to cause your generator the kinds of longer-term maintenance issues that are associated with gasoline and is also more shelf stable than gasoline, making it a solid choice for storing over long periods without deterioration. In this section of the guide, we’ve taken a look at the best dual fuel backup generators for use at home or on the road during an emergency situation. This emergency generator is as versatile as it is durable and utilizes a dual fuel system meaning it can operate on either standard gasoline or alternatively, on liquid propane (which burns cleaner and can significantly increase run time). Other than the operating efficiency, there are a few other benefits to being able to run on this kind of fuel such as the ability to store it for years at a time (gasoline begins to deteriorate over time) and the clean-running characteristics of propane mean it’s not going to accumulate or build-up within the carburetor of the generator in the same way that gasoline would. 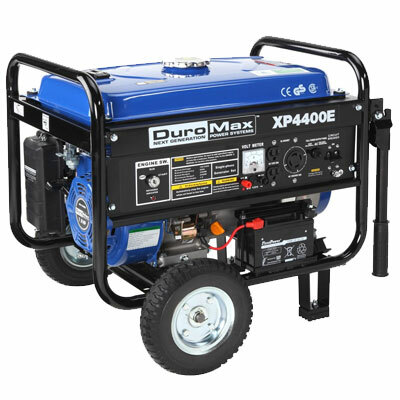 Beyond this, the build quality and ease of use of the Duromax XP4400EH means that this is a solid backup generator choice if you’re looking for an emergency power redundancy that delivers a Max AC output of 4400 watts and the ability to run for between 8 and 20 hours depending on fuel type. 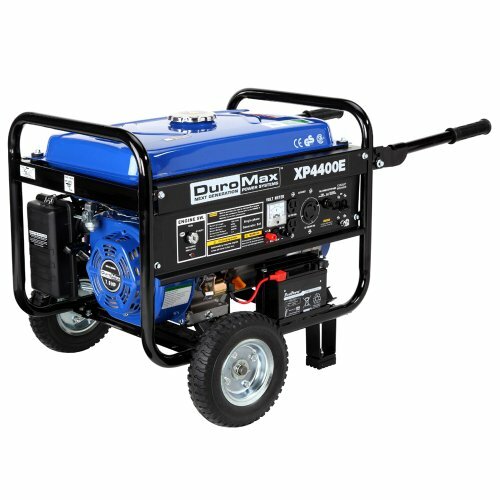 In terms of performance and feature set, the Duromax XP4400EH portable generator packs a lot of features (and power) into it’s small frame. 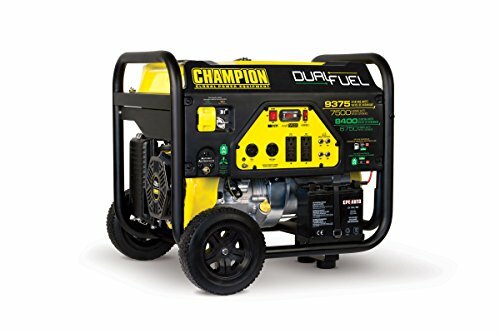 As mentioned earlier, the 7 HP unit utilizes both propane and gasoline for maximum adaptability to help meet your needs and you can expect a rated AC output of 3500 watts with the Max output stretching to 4400. Construction and build quality are always important practical consideration when it comes to a portable backup generator that’s likely to see action in less than favorable conditions and in this case, the XP4400EH with it’s heavy-duty steel frame, four gallon fuel tank capacity, and air cooling. Coming in at around 132 lbs when empty, the XP4400EH is just about manageable enough to move where you need it most by hand and is perfectly suited either as a home emergency backup generator or as a portable generator for packing as part of a vehicle load-out if you find yourself needing to evacuate quickly by road. Expect to factor in around another 24 lbs for gasoline to this equation, but the inclusion of all-terrain, never-flat tires and handles effectively negates this when you need to move the unit around. 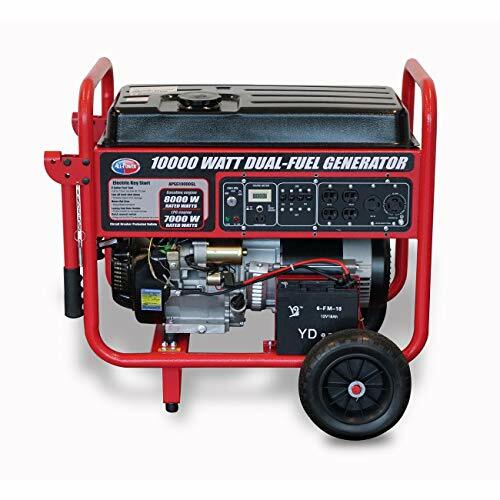 This dual-fuel backup generator packs a serious punch with the ability to deliver up to an incredible 6750 watts when running on propane and 7500 watts when fueled with gasoline. As with other dual fuel generators, the major strength of the Champion comes in the flexibility to operate on two types of fuel, reducing the dependency and increasing the unit’s adaptability in the real world. The 439cc Champion utilizes a solid combination of functionality and build-quality to deliver a backup power generator that’s capable of providing significant output in an emergency situation. A built-in surge protector prevents overload scenarios while the unit allows you to easily monitor voltage and run-time hours so you’ve got a clear picture of power output. Operation is effectively out of the box (after adding fuel of course), thanks to the one touch push button electric start to get you up and running at the touch of a button, while the system’s ‘cold start’ technology ensures that the generator gets underway in even the coldest conditions making it perfect as a backup generator for use in a winter storm blackout scenario. 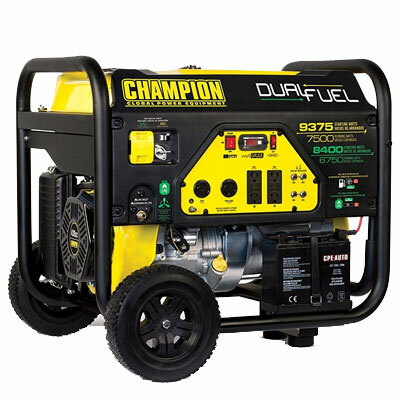 A 6.1 gallon fuel tank allows the Champion generator to run for up to 8 hours at half load if the tank is full of gasoline and the inclusion of a 3.3 foot propane hose with built-in regulator makes it incredibly easy to hook up to a propane bottle if that’s your preferred fuel-source – expect 5.5 hours of output when hooked up to a 20-pound propane tank at 50% load. This 10000 watt duel fuel generator from All Power America is rated to 8000 watts of gasoline-fueled power and 7000 watts when fueled by LPG. With the ability to run for up to 11 hours at half load and providing 2 AC duplex 120 Volt outlets, this generator is a reliable choice if you’re looking for a backup power generating solution that will keep you connected in the event of a serious incident or emergency that brings the grid down where you live. An electric start button and recoil start provide the ease of use and redundancy to ensure that if the power goes down, starting up your backup generator wont be one of your problems. Capacity for holding up to 8 gallons of gasoline will allow you to hit a running output of around 8000 watts from the 15 HP, 420cc air cooled engine. In terms of portability, this generator includes a wheel kit and folding handles to quickly move the unit where it’s needed. Single fuel portable generators are probably what you think of when you picture an emergency generator and nine times out of ten, they’re powered by gasoline. The benefit of this type of portable generator unit is that they’re often cheaper than dual-fuel alternatives and are incredibly simple to run – just add gas and you’re good to go. While you don’t benefit from the flexibility of dual fuel generator units, the best single fuel generators are still an excellent choice for ensuring resilience in the face of a power outage at home or when you’re need of portable electricity on the road. 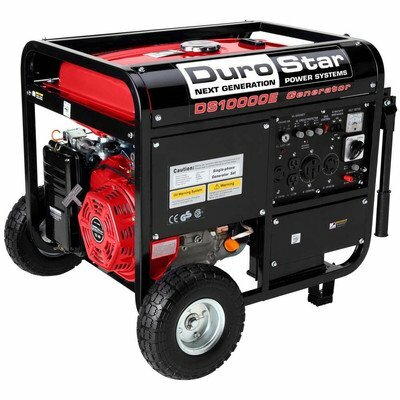 In the world of emergency and portable generators, DuroMax have cultivated a reputation for reliability and high quality, both of which are characteristics that describe the DuroStar DS10000E generator. This 16 HP, air-cooled engine is rated up to 8000 watts with a surge capacity that increases this to 10000 watts. A rugged build quality makes this generator both portable and durable with a heavy-duty frame, wheels, and handle making it well suited for rapid deployment at home or in the field. From a full tank of gas, you can expect to get roughly 10 hours of run time when running at 50% load, providing enough power generation capability to keep anything from home appliances and lighting to workshop equipment running during that time. The inclusion of a full power panel including an oil warning light, volt meter, circuit breaker, and power outlets mean you’ll have full ease of access to the most essential elements of the generator without searching around during operation. Similarly, the generator includes in-built low oil protection, AC and DC regulators, and a spark arrestor to ensure it runs safely and at optimum efficiency at all times. Choosing the best portable generator is never a one-size-fits-all activity with individual budget, specific requirements, and personal preferences sometimes varying considerably between people, locations, and uses. With these considerations in mind, this guide looks to provide advice on our own opinions of the best backup generators and emergency gas generators available today, however, it’s always important to carry out your own due diligence to find the best solution for you when deciding on a portable emergency generator solution that’s perfect for your situation.